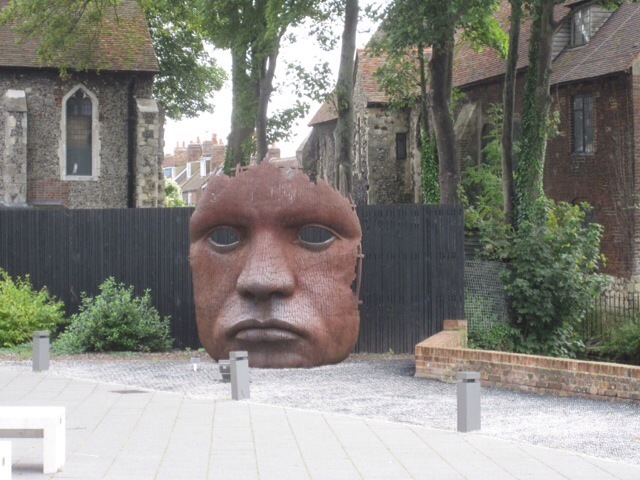 Some of the information sites say that Canterbury can be really enjoyed by bike, and we did see a lot of cyclists around town today, but we decided to rest some of our muscles and explore the city on foot. It was a wonderful but tiring day. 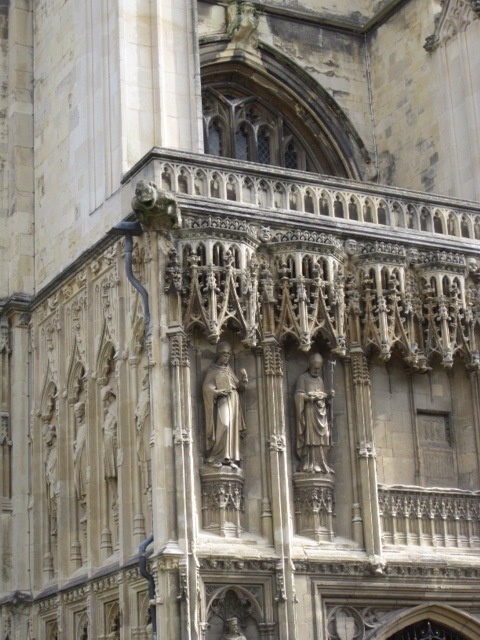 At Angie’s instigation, we decided to set out early to tour Canterbury Cathedral. It was a wise move, because it got really crowded after a while. Unfortunately, some parts of the cathedral were closed for part of the day but we made it work for us by going back later in the day after we had done some other stuff, and our tickets enabled us to re-enter. The highlight of the day was definitely the cathedral, about which I will say more shortly, but I do want to mention a couple of cool sculptures we saw when we detoured a little to the Marlowe Theater on our way. Christopher Marlowe, the author of Doctor Faustus, among other plays, was born in Canterbury and died at the young age of 29 in mysterious circumstances. 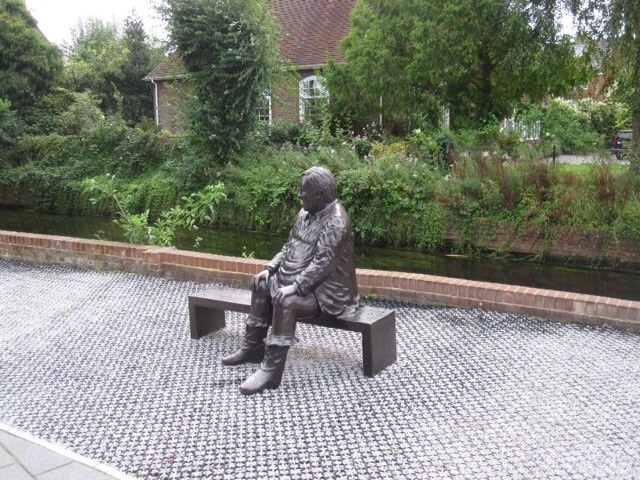 He was born around the same time as Shakespeare and apparently was quite an influence on him. I’m posting the pictures from today all together at the end because the free wifi at the hostel does not extend to our dorm up at the top of the Victorian building in which it is housed. Back to the cathedral. It’s massive, and not just the building alone. What they call the precinct takes up a huge amount of space in the center of the city. It’s a significant place for many reasons, including its founding in something like the 8th century by St. Augustine (who Angie says did not have what you might call enlightened attitudes about women, but then, back then who did?). 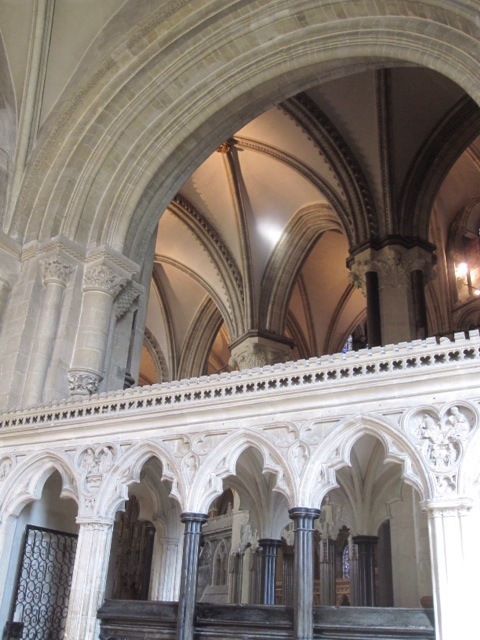 It’s also renowned for its architecture, notably the Norman stuff (the oldest parts of the existing structure date from about the 12th century), and of course it’s where a gang of knights murdered Thomas Becket. 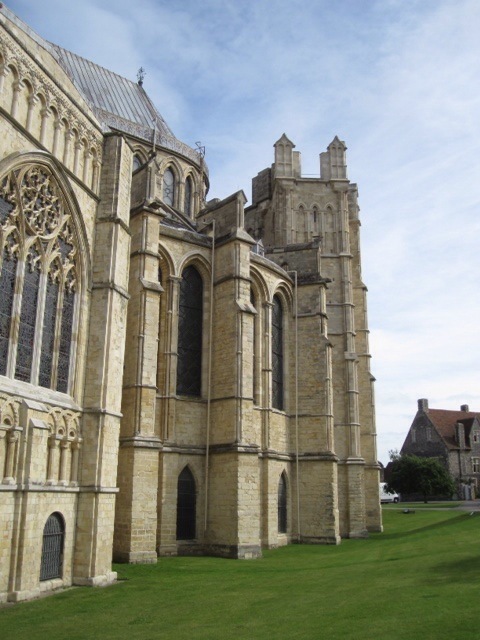 He was an archbishop of Canterbury who was besties with the king until he wasn’t. This king was Henry II, who ticked Becket off over how he used the Church regarding his coronation or some such thing. This led the king to say words to the effect of “will no one rid me of this turbulent priest?” A few knights took the hint and murdered Beckett IN the cathedral. One of the reasons we wanted to go back to the cathedral was because this morning the area where this happened was closed off. I’ve always found it to be a tad cool (though In this case rather ghoulish) to actually be in a space where history happened, such as when I stood on the grounds of the Agora where Socrates plied his philosophical trade back in the day. We also got to see the nave and some other parts of the cathedral when we went back this afternoon, and the whole place is truly epic. The grounds are pretty cool too, including the buildings of the Kings School. 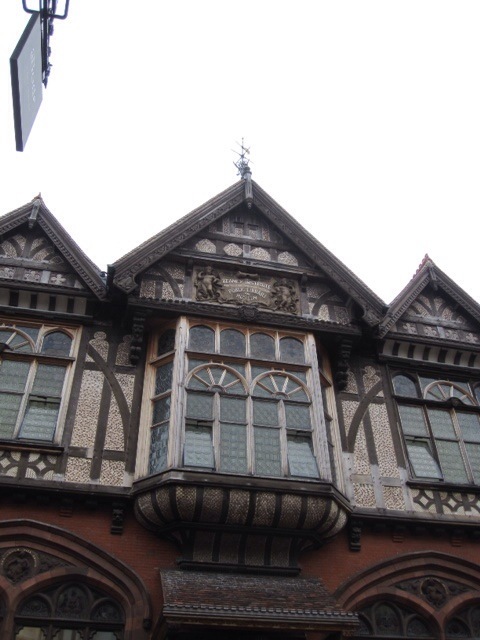 We were unable to locate the site of the synagogue that was on the grounds, but there had been one there and in other parts of the city since the 13th century. There is no longer an active synagogue here though. 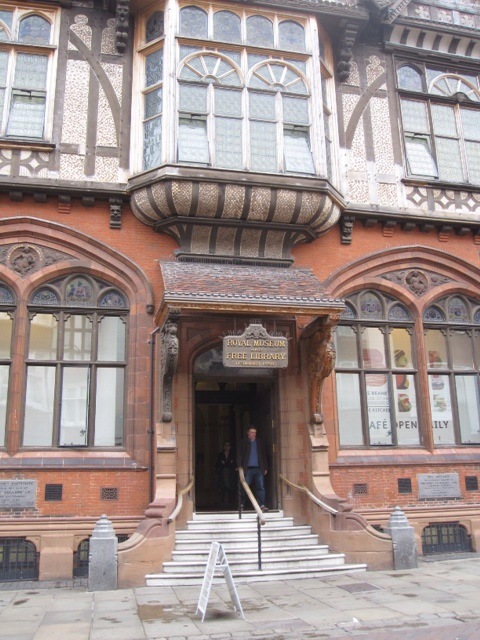 The second place we wanted to check out today was the Beaney, which is a museum of sorts. It houses some cool artwork (including at present a fantastic exhibition from the Taylor Wessing Photographic Portrait Prize) as well as a lot of artifacts (aka spoils as Angie pointed out). The museum was founded by a local boy made good who did most of his making good in Australia. He was initially rebuffed by the city leadership when he wanted to create a home for the poor. As one note we read said, the mayor said “wouldn’t you rather give us the money for a nice new town hall?” and Mr. Beaney said “no,” so initially the city got bubkus, but in the end Beaney died and left the city what became the institution bearing his name. This was the best of what we did today, but the center of the city is a fascinating mix of historic buildings amid (and sometimes playing host to) a tremendous amount of commerce. Final comment on the day. While we were preparing dinner at the hostel, a couple came In who appeared to be carrying handlebar bags. I asked if they were biking and they are, in fact they are heading for Dover tomorrow, as we are, to hop on the ferry to Calais. I thought beany should be a coffee shop. Maureen, in the fourth photo from the bottom, there is a shaded part of the walkway. I was there with English friends long ago (1983? ); the Archbishop of Canterbury was holding a service with the Archbishop of Poland. We were lurking around in the spot in your photo when along come both Archbishops. The A of Canterbury stops, gets hold of my friends’ two-year-old and plants a big smooch on him. His mother didn’t bathe him for a week! 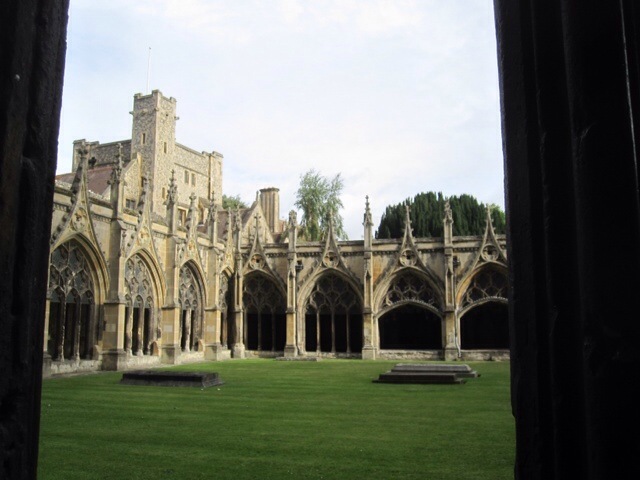 I loved that cathedral, and yes, it’s very real to stand in the spot where they murdered Thomas Becket. Sounds like you and Angie are having some good fun, despite sore muscles and stinging nettles. That is such s great story Molly.